This translation of Martin Luther's 95 theses was published in the Works of Martin Luther by Adolf Spaeth et al [means "and others"]. Published 1915. It's important to notice that all of the 95 theses have to do with indulgences. 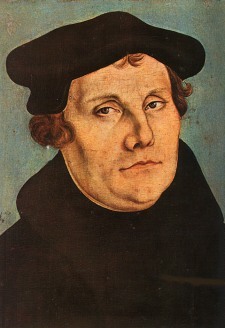 Since Luther's most famous doctrine is Sola Fide, it's often assumed that this was the topic of the ninety-five theses or that they covered many of the doctrinal issues he had with Roman Catholicism. They did not. They all concern indulgences. I posted Martin Luther's 95 theses on this site long ago, but not everyone understands either the context or the meaning of the theses. So, to the actual text of Martin Luther's challenge, I will add just a couple paragraphs of historical context and an explanation of each thesis. It is often thought that Martin Luther was protesting the Roman Catholic Church in the 95 theses, or that much of his Reformation theology is espoused in them. That is not true. Martin Luther was a good Catholic when he posted his debate challenge, and the topic was purely the subject of "indulgences," and more specifically the abuse and sale of indulgences. (A brief definition of indulgences would be a release from the penalty of sin based on the merits of Jesus and the saints.) The specific issue was that Johann Tetzel, sent by the pope to earn money for the building of St. Peter's Basilica in Rome, was preying on the ignorance of poverty-stricken and superstitious Germans, collecting money from them to buy the release of their relatives from the fires of Purgatory. Martin Luther was not merely protesting. He was issuing a general challenge to a public discussion with the 95 theses as the topic of discussion. The reason that it was possible to invite the public to a discussion of ninety-five topics is because Luther had really only covered one topic. He had 95 arguments, or almost 95 arguments, against indulgences, but indulgences were his one topic. 1. Our Lord and Master Jesus Christ, when He said Poenitentiam agite ["Repent"], willed that the whole life of believers should be repentance. Poenitentiam agite is a quote from Matthew 3:2 and 4:17 in Jerome's Latin Vulgate. Modern English translations have "repent," though poenitentiam agite literally means "do penance." Martin Luther begins his arguments against indulgences by saying that we should be living lives of repentance. The attempt here is to divorce the penalty of sin from any penance prescribed by a priest. In the arguments that follow, he will tie the penalty of sin to repentance and hatred of self rather than to a penance that the Church can prescribe are take away. In what would become the Protestant motto, Luther does exalt the command of Jesus over the tradition of the Roman Catholic Church, though it becomes clear as we progress through his theses that he expects the pope to agree with him on these things. He is trying to oppose Johann Tetzel and to stop his extortion of the German people, not to oppose the pope or the Church. Luther argues that all inward repentance will, by its very nature, produce "divers mortifications of the flesh." In other words, true repentance will put the flesh to death in some outward way. Luther reference "the penalty" because that is what an indulgence is supposed to remit. He ties the penalty of sin to hatred of self that should never end rather than a temporary penance issued by the Church. Here Luther begins to make use of what he has asserted in the first four theses. The repentance that matters, he has said, is what Jesus has commanded. That repentance never goes away, and it is not a penance prescribed by a priest. So here he follows those assertions up by stating that the only penalties that the pope can remit are those that he has imposed himself by his own authority or on the basis of established ecclesiastical rules (canons). The pope can only remit guilt if God has remitted it. There are areas reserved to his judgment that only he can remit. When God remits guilt, he also humbles the repentant person, and he requires of penitent that he be subject to God's representative, the priest. The point here is that this type of remission cannot be gained by putting money into Johann Tetzel's money box because that does not produce humility nor bring about subjection to the priest. Note that Martin Luther is still a good Catholic and priest at this point. He has much to say, even in his later Protestant writings, about submission to the pastor. Here, he is promoting a better route to remission. In confession, penance is assigned to humble the penitent person and this penance is done in submission to the priest as God's representative. Penitential canons were rules about the prescribing of penance after confession. The penance included things like prolonged fasts or banishment from the communion table for periods that could last for over a decade. Martin Luther points out that the canons that the church is allowed to prescribe all have to do with things that concern the living. They do not include purgatory. This is an obvious foundation for the argument that the Church cannot limit the length of purgatory, but can only remove penalties that it has imposed. If a priest receives a confession from a dying person, then issues him a penance that will be performed in purgatory, then that priest is ignorant and wicked. He is ignorant because the penitential canons allow no such thing, and he is wicked because even a dying person should be granted full cleansing of the soul before departing this life. This habit of prescribing penalties to be paid in purgatory is compared to the sowing of tares by an enemy in Jesus' parable in Matthew 23:34-40. The references to the bishops sleeping might be a harmless reference to the parable, but it is more likely a jab, an early display of Martin Luther's acerbic wit. The prescribing of penalties by a priest was for the purpose of testing true sorrow, true repentance. Once those penalties were performed, only then was the penitent absolved of his sin. Since the penitential canons apply to this life only, and priests are only to administer penalties that can be performed in this life, then the death of a Christian frees him from all such penalties. They cannot be performed by those who have passed on, and so they are released. Luther now leaves the discussion of penalties in this life versus penalties in purgatory. His new subject concerns the fear and despair of the dying. The less love that the dying person has shown in his or her life, the greater is their fear as they face death. I don't think this needs explanation in light of the explanation of theses 14 and 15. Purgatory is supposed to "purge" the sinner whose sins are not so great that he should go to hell. Hence the name "Purgatory." As the sinner finds his conscience purged in purgatory, his fear and despair should grow less, and his love should increase. This, like so many other theses in Martin Luther's treatise, is just a buildup for the following theses. Here he says that no one has proven that those in purgatory cannot receive merit in the way of increasing love. Still setting a foundation for following theses, Luther points out that no one has proven that all of the people in purgatory are certain that they will leave purgatory for heaven. Nonetheless, for some reason I do not understand, he says we may be quite certain it is true that all those in purgatory have an assurance that they will arrive at blessedness. Since some penalties are remitted in purgatory to the benefit, in growing love and lessening fear, of the resident there, the pope cannot offer to remit all penalties, but only those that he himself has imposed. We should emphasize here that indulgences are meant to remit the penalty of sin, not sin itself. The sin itself needs to be forgiven through repentance and confession, but even a forgiven sin sometimes involves lamenting, mourning, and weeping (James 4:9,10). The Roman Catholic Church has taken this so far that some sins obtain a penalty of purgatory before real deliverance from sin occurs. Here, once again, Luther concludes that the only penalties for sin that the pope can remove are the ones that he himself has prescribed. This would have been a claim of Johann Tetzel, and probably others. Luther denies it based on his previous points. Luther is explaining his conclusion of thesis 21, so he repeats some of his earlier points. Here he says that when the preachers of indulgences promise to remit penalties in purgatory, they are outside their bounds because any penalty being paid in purgatory does not belong to this life. Luther has shown earlier that the pope can only remit penalties that can be carried out in this life because those are the only ones he is allowed to impose by the canons. Even if it were possible to grant someone the remission of all penalties for the sins they have committed, this would surely be true to very few people, those who have lived the most perfect lives. Therefore, since, at best, only a rare few could have all their penalties remitted by an indulgence, then the majority of people are being deceived by the claims of the indulgence preachers. The pope's power over purgatory can be compared to a bishop's authority over his own diocese and parish. Statements like these are confusing as you read through the 95 theses unless you realize that they are foundations for later arguments. Reading a statement like this is like reading the start of a sentence. Read on and Martin Luther will tell you where he is going. The parentheses belong to Martin Luther. However, at this point in his life, Martin Luther would not have denied to the pope the power of the keys of the kingdom (Matt. 16:18-19). Therefore this is mistranslated. Another translation reads: "(which he cannot exercise for them)." Such a translation fits in with everything Luther has been saying. The pope cannot use the keys of the kingdom, which he does possess, to help people in purgatory. He can only help those who have penalties that belong to this life, penalties which the pope, either personally or through the local priest, has imposed himself. Therefore, it is a good thing, Luther argues, if the pope prays for people in purgatory to have their penalties remitted, but he cannot remove penalties to souls in purgatory by the power of his office. In English, this is "As soon as the money jingles in the box, the soul leaps out of Purgatory." Luther says that those who say this are preaching the doctrines of men. Luther turns their jingle around and says that it is gain and avarice that can be increased by pennies jingling in money-boxes. The intercession of the Church produces the power of God, not money. Luther moves on in a surprising direction. What if there are souls that do not wish to have their time in Purgatory shortened? He references Saint Severinus of Noricum, a fifth-century Christian, and Pope Paschal I, who are supposed to have offered to go to Purgatory and bear its pains on behalf of other faithful believers. It is very hard to track down this legend! So far all I have been able to find is rumor. I will keep looking to see where it came from. There is a Vita Severinus, a life of Severinus, written by Eugippius. I'll see what I can find in it. Pope Paschal I was pope from 817 to 824, and Severinus belongs to the mid-fourth century. He was the mentor of the famous desert hermit Anthony. I am sure that this would have been considered an undeniable truth in Luther's time. It would not be a popular teaching in our own. You can be sure, however, that if Luther presents this statement without evidence, then he was confident it would be accepted as true without argument. Martin Luther does not oppose indulgences in general. He opposes the improper use of them, and these 95 Theses are an explanation of what Luther sees as improper usage. The proposed public discussion probably never occurred in the format Luther was expecting. Instead, the discussion occurred without his supervision all over Germany after these theses were printed and reprinted by others. Luther asserts that those who assure themselves of their salvation because of a letter of pardon, which is what an indulgence is, will be eternally condemned. In other words, beware of those preachers of indulgences who tell you that they will reconcile a man to God. The purpose of an indulgence is to remove some earthly penalty imposed by the church, such as temporary banishment from communion or a period of self-affliction. Reconciliation to God is not the purpose of an indulgence, and we should beware of those who say they are. Luther gives us a new phrase here: "sacramental satisfaction." That is what we have been describing. Indulgences can free you from penalties that are prescribed by priests, but not from penalties bestowed by God after this life. Be assured that every Roman Catholic with any theological training and sincerity in their faith, even in the sixteenth century, would have agreed with Martin Luther on this ones. However, the hawkers of indulgences had stooped so low that they were promising instant release from purgatory as soon as a coin fell in the money box. There was no contrition necessary from the one who paid the money for they were not paying for penalties that were their own, and there was no way to know if contrition existed in a soul that is in purgatory. So the indulgence preachers said it was not necessary. This was not Roman Catholic theology, it was greed and evil sales methods by salesmen with corrupt souls. 75. To think the papal pardons so great that they could absolve a man even if he had committed an impossible sin and violated the Mother of God--this is madness. 82. To wit: "Why does not the pope empty purgatory, for the sake of holy love and of the dire need of the souls that are there, if he redeems an infinite number of souls for the sake of miserable money with which to build a Church? The former reasons would be most just; the latter is most trivial." 83. Again: "Why are mortuary and anniversary masses for the dead continued, and why does he not return or permit the withdrawal of the endowments founded on their behalf, since it is wrong to pray for the redeemed?" 84. Again: "What is this new piety of God and the pope, that for money they allow a man who is impious and their enemy to buy out of purgatory the pious soul of a friend of God, and do not rather, because of that pious and beloved soul's own need, free it for pure love's sake?" 85. Again: "Why are the penitential canons long since in actual fact and through disuse abrogated and dead, now satisfied by the granting of indulgences, as though they were still alive and in force?" 86. 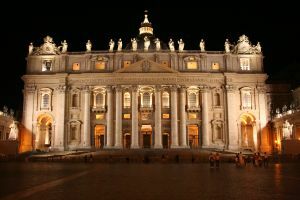 Again: "Why does not the pope, whose wealth is today greater than the riches of the richest, build just this one church of St. Peter with his own money, rather than with the money of poor believers?" 87. Again: "What is it that the pope remits, and what participation does he grant to those who, by perfect contrition, have a right to full remission and participation?" 88. Again: "What greater blessing could come to the Church than if the pope were to do a hundred times a day what he now does once, and bestow on every believer these remissions and participations?" slowed by the 95 Theses. Those are the 95 theses that changed the world! Basically, this document, nailed to the cathedral door at Wittenberg (a common thing to do when you wanted to make a public announcement), ruined the trade in indulgences in that area. Pope Leo X was engaged in building St. Peter's Basilica, and Martin Luther, an unknown monk, had suddenly stopped the inflow of money. It was this problem, begun by these 95 theses, that started the Reformation and changed the world.